© 2005-2011 Take-Two Interactive Software and its subsidiaries. All rights reserved. 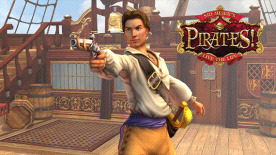 2K Games, the 2K Games logo, and Take-Two Interactive Software are all trademarks and/or registered trademarks of Take-Two Interactive Software, Inc. Sid Meier’s Pirates! © 2005-2011 Firaxis Games, Inc. All rights reserved. Mac and the Mac logo are trademarks of Apple Computer, Inc., registered in the U.S. and other countries. Feral and the Feral logo are trademarks of Feral Interactive Ltd.